I'm really excited to start curing meat in the new house. There are a few recipes from last year that really came out great that I want to retry, a few new ones to attempt for the first time, and some that need tweaking. All this anticipation made me rather hungry, so I cut into one of my last curings from the old house: my Kindzuik with Pork Belly. This is the second kindzuik salami I made. The first was shaped in a flat dish and pressed under weighted boards, as would normally be done when kindzuik is stuffed in a pig stomach. This second one was not pressed, but shaped in a ball as if it was stuffed in a pig's bladder (also traditional). Since I had nether stomach nor bladder for stuffing, I used caul fat for both. Aside from the shape, the only major difference between this kindzuik and the first, flat one is the inclusion of cubes of pork belly as the fat. 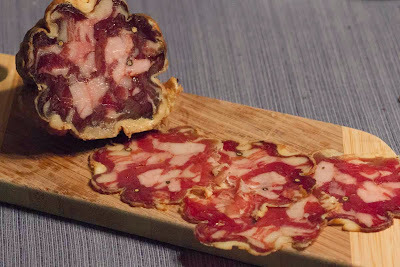 Researching kindzuik, I saw some photos of beautifully cured slices, with clearly defined cross sections of pork belly visible in the salami. It was something I hadn't seen before, and just had to try. So I picked up a pound of fresh belly from North Woods Ranch and got ready to cure. 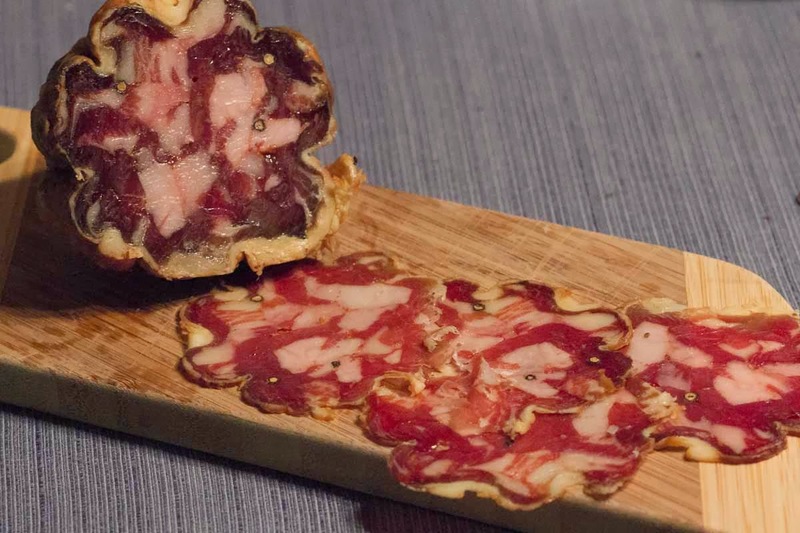 Pork belly aside, this kindzuik is mostly made from chunks of grass-fed beef, spiced with majoram, bay leaf, white pepper, allspice, sweet paprika, and yellow mustard seed. Then it was tied in caul fat, aged for a few months, smoked over alder wood, and then aged for a few more months. 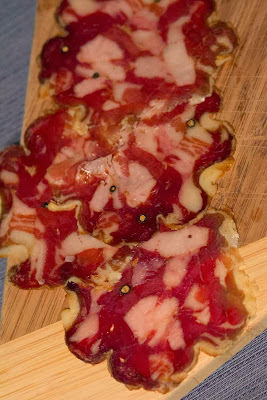 I love the beautiful red color of the cured beef, and I'm so happy to see cubes of pork belly stand out in the mix. The spices are warm and savory, and the softness of the alder smoke keeps the meat from being overwhelmed with smokey flavors. I'm really glad I sprung for the alder; I momentarily considered using oak or hickory, but I think that would have thrown everything off. Given the choice, I would do this ball shape again, over the flat-pressed kindzuik. For the extended curing time, I think the ball helps to keep the meat protected against becoming too hard and dry. Perhaps that would change if I was using a thick casing, like real pig stomach. Hmm. So the experiment continues!